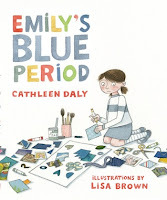 Emily's Blue Period by Cathleen Daly and illustrated by Lisa Brown is a sweet picture book on the Texas Bluebonnet List for 2015-16. 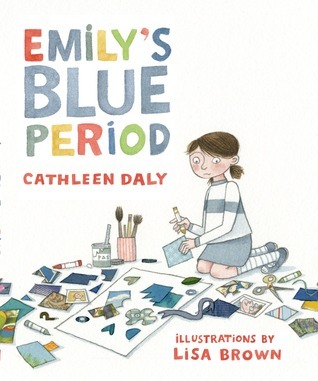 Emily is artist who finds out that even the best artists got through a "blue period" when things in their life make them sad. Emily's blue period starts when her family gets mixed up and she has two houses to live in - one house for her mom and one house for her dad. Which one is her "home"? It isn't until her brother quotes a potholder... "Home is where the heart is"... that Emily gets an idea and her creative juices start flowing again.